See our class schedule at Classes from 06:00am to 9:00 pm every day. 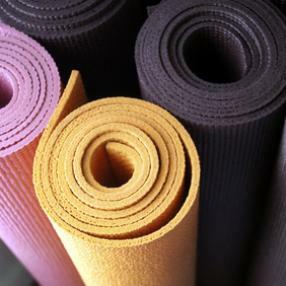 A wide variety of classes suitable for beginners through to experienced yogis. Beginners courses running. Practise yoga at a height of 80m. Try a sun salutation whilst looking at the beautiful views of the city. Vinyasa means flow which allows a continuous flow of movement between yoga poses creating a dynamic yoga class. This style of yoga is perfect for those of you looking to maintain your fitness but take a mindful approach allowing the body to stretch and strengthen at the same time. Don't worry though you will still get your 5 minutes of relaxation at the end of the class. This is an open level class and will be suitably adapted to your needs whether you are new to yoga or a more experienced yogi. A class using posture, breathing awareness , simple meditation and Yoga Nidra, the class will be adjusted to whoever is there each week and how they are at that particular time. Come and ease out your stiffness and the strains and stresses of the day. Yoga for Beginners is a great class for anyone looking to refresh their practice or just beginning. All you need to bring is your sense of humour. and maybe a mat or grip towel, but we hire mats out should you need one. Saturday morning gentle healing yoga for intermediate to advanced yogis. If you suffer with back pain this 30 minuted gentle lower back stretching is what you need. Suitable for all abilities. A Hatha Vinyasa Flow class, suitable for all abilities. Each week we will explore a new sequence and range of postures. Class includes opening meditation, breathe focus, stretch, flow and relaxation. Deeply stretch the body and open the joints using gentle and accessible restorative yoga poses; relaxing breath and mindfulness techniques so you are ready to start your weekend! During the Yoga Intensive Programme we will be using the asanas from Himalayan Hatha and Kriya Yoga. Kriya Yoga – ancient Vedic knowledge passed through generations, science of breath and movement, focused on recharging the body with oxygen, slowing down the ageing process, rejuvenating the brain and spinal centres and transforming mind and body. Himalayan Hatha Yoga – the science practised by ancient Indian Yogis. This yoga practice improves flexibility, strength and stamina, improves the posture, reduces excess weight, makes the movements easy and graceful. We will also learn the foundations of Reiki and Qigong (Tao Cosmic Healing) – invaluable long-lasting healing skills which are easy to practice at any time of your life. Harmonies your mind and body, this basic style helps to reduce stress and tension, improve circulation, increased strength, balance and flexibility. Set your self up for the rest of the day . Multi class pass discount available, view the memberships tab for more info. Our class cancellation policy is 24 hours prior thanks. Zen Yoga combines mindful posture and flow routines with an aim to find strength and softness in the body and mind, build flexibility and develop our connection with the ground and the world around us. The basis of Zen Yoga philosophy is the conviction that it can benefit all body types; if you can breath, you can benefit from yoga. The sequence and intensity of the class vary in accordance with students’ experience, energy and prowess. This class is accessible to beginners, while also challenging for intermediate students – with individual attention paid to each student. An open Dynamic Flow yoga class for everybody with some experience in Yoga. We cover asana, pranayama and meditation. Connect, laugh, play, stretch and relax with your child through yoga-based exercises. Combining Hatha Yoga postures and mindfulness techniques we will work our way through this class with a steady flow and finish the class with a mindful meditation. Be encouraged to practice with curiosity and compassion whilst cultivating a positive connection between body and mind. Taught with a non-esoteric approach this class is open to all levels, beginners especially welcome. A strong and sweaty dynamic flow in a Yang style of yoga to build strength and stamina and to wring out the day, movement is continual and fluid, set to a mindful and steady pace that progresses in intensity, specifically the ancient art of Vinyasa Krama – the correctly organised course of yoga practice. This is followed by a delicious Yin yoga sequence with held restorative poses that allow the body to open and release. These yin poses are supported with props, to encourage the body to release and open without tension. Poses are often held for several minutes with relaxed musculature to encourage fascia, connective tissue that is found everywhere in the body, surrounding bones, muscles, ligaments and tendons, to ease and open. This results in deep releases into tight spots and areas of holding, a deeper connection with the breath as the diaphragm and intercostal muscles become less constricted along with a calm awareness of the mind. Yang and Yin by candlelight cumulates with a soothing Yoga Nidra (a deep guided meditation also known as yoga sleep) to leave you feeling wonderfully relaxed and rested. Glow Yoga Yang and Yin by candlelight is the perfect way to rebalance and restore you, understanding the need to move and sweat but also to rest and release deeply. 60 and 75 minute classes.